OK Marc, so films sets and masses of horses are cool and all, but why are you making a fuss about this weird looking camera thing? Alright, alright. In the days where on set publicity stills photography is practically a science due to digital, I like to take a few risks to keep my life interesting. This burning desire to keep things fresh caused me to look back and stare in awe at large format cameras. Yawn. A life story in an introduction? Learn to write better, Marc. Fine! The long and short of it is this, I really, really like large format photography, it’s a totally different experience to shooting digital or even 35 mm film. It’s presented me with more challenges than I have ever faced before in the photography industry. To prevent buggering everything up totally you actually have to know what you’re doing and plan your actions in advance, and this is before taking into the special considerations of working on a film set. It’s also exciting for you, because [Cue reality TV style tension filled background music] if I screw it all up, I’m costing the producers a fair bit of cash for no reason other than my own vanity. That would be a healthy knock to my reputation of being 100% reliable. So, your making your life harder? Why? If I never took up a challenge, I would not be where I am today, I like to test myself to the breaking point, learn from the experiences and hopefully reap the benefits. Technically speaking, a large format camera, even in 2013 has little direct competition when it comes to pure picture quality. Modern lenses and sensors are technological marvels and I love them dearly (sometimes), however technology can’t beat physics. Large format cameras typically shoot negatives that are 5×4 or 10×8 inches. That alone is larger than most modern cameras, and it picks up every single bit of detail imaginable. Look below for a size comparison. Marc. 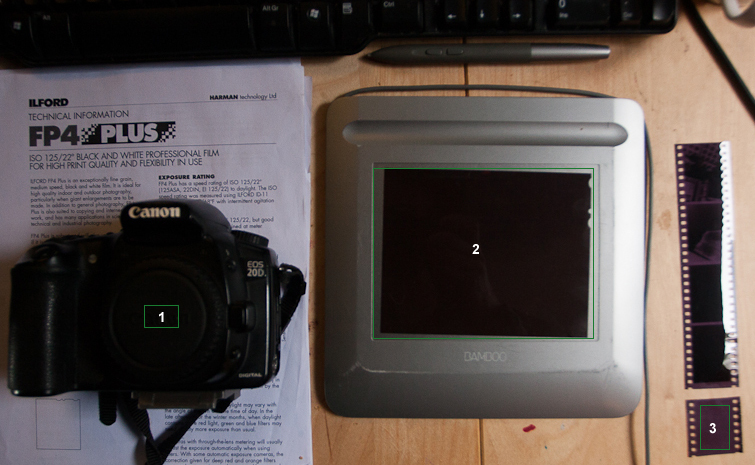 Why are you showing me a roughshod snapshot of a filthy camera nerd’s desk area? 2. A sheet of 5×4 Kodak Professional portra 16 VC Film. It’s a dead negative that was accidentally buggered up. 3. Some Ilford XP2 35mm film. The negatives from a previous movie I shot on. See how damn huge that Kodak negative is? It’s bigger than my 20D! If scan that sucker in we’ll get resolutions knocking around 60+ megapixels, a resolution only otherwise available through eye wateringly expensive digital medium format cameras such as the Phase One P65+, which costs about the same as a new car. Affordable, huh? This is the core basis of why I’m doing this, because it’s hard, and because it’s unparalleled. Over the next week or so I’ll be doing articles explaining the really nitty gritty details of my shooting process. From picking my camera and lens, to principal photography, and even to development and scanning, I’m going to cover everything about this highly mysterious and surprisingly not that well documented type of photography. This entry was posted on February 1, 2013 by marchankins. It was filed under Photography and was tagged with Film, Ilford, Kodak, Large Format Photography, Marc Hankins, marketing, Movies, Photography, Stills.